Julie Koenig has been a professional harpist since 1980. An Ohio native, she played seven seasons with the Dayton Philharmonic Orchestra. She holds a Bachelor of Music degree in Harp Performance from the University of Cincinnati College-Conservatory of Music. While living in Miami, Julie played along coastal Florida, with the Philharmonic Orchestra of Florida and Palm Beach Opera. Julie came to Atlanta in 1990 to continue freelancing and became principal harpist of the Georgia Symphony Orchestra in 1994. She has also performed frequently with the Atlanta Symphony, DeKalb Symphony, Georgia Philharmonic, Atlanta Philharmonic, and Johns Creek Symphony, as well as with the Atlanta Pops, Atlanta Ballet, and Atlanta Opera orchestras. Julie has backed various artists, including Yo-Yo Ma, Amy Grant & Michael W. Smith, Itzhak Perlman, Indigo Girls, Trisha Yearwood, and Ray Charles. She has also provided music at private events for Jimmy Carter, Tyler Perry, Tom Glavine, Coca-Cola, Home Depot, and Widespread Panic. 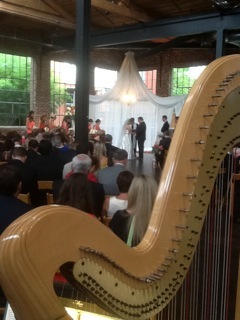 Julie has played harp for multitudes of wedding ceremonies - well over 2,000! - and countless receptions, dinners, church services, recitals, orchestra performances, choral concerts, grand openings, housewarmings, bridal showers, and other special occasions. She has been a featured soloist playing concertos by Ravel, Debussy and Mozart, has performed on European tours in Rome, Italy and Vienna, Austria, and has appeared on several recordings. In her spare time, Julie can usually be found walking her golden retriever. *For a list of Seating of the Mothers/Unity Candle/Interlude, Processionals and Recessionals, please visit the WEDDING AUDIO page. If you don't see your favorite artist or song, request it! Click below to play the MP3 audio samples. Additional volume control is available on the right end of each play bar. Enjoy! Julie plays a Venus Diplomat for weddings and concert performances. Her harp is an acoustic instrument but is also fitted with a transducer pick-up to amplify as necessary. This creates the best of both worlds, providing music ranging from an intimate setting to a crowded ballroom. The Diplomat is a concert grand pedal harp with 47 strings, ranging nearly seven octaves. It has a dark red mahogany finish and fluted column, built in 1981 by the W&W Musical Instrument Company in Chicago. Its spruce and maple hardwoods were cut from forests on Mount St. Helens in Washington...before the 1980 volcanic eruption! This harp was rebuilt in 2014 by W&W, utilizing hardwoods from the Pacific Northwest to replace the soundboard, base and neck. It features a Lyon & Healy 17 decal and has golden highlights in the column's fluting, as well as on the base and neck, making this harp truly one-of-a-kind.